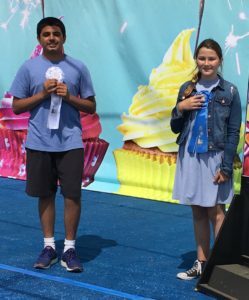 Congrats to Academy for Public Speaking grads Derek Song, Ella Engelberg, Nathan Qiu, and Tanvir Bhathal for presenting award winning speeches in the 2018 San Diego County Fair Speech Contest! The topic was If I Could Change One Thing. Contestants in K-5th had up to 3 minutes to speak. Although this was Derek’s first speech contest, he won 1st place and $300 in the K-5th division. Academy for Public Speaking graduate Nathan Qiu won 3rd place and $150 in the elementary division. Nathan also won 3rd place earlier this year in the Del Mar Solana Beach Optimist Club Oratorical Contest. Tanvir Bhathal won 3rd place and $150 in the middle school division for his humorous speech about food. Ella Engelberg also used humor extremely well, and she won 1st place and $300 for the second year in a row. Last year was Ella’s first time competing. Ella also competed in the Del Mar Solana Beach Optimist Club Oratorical Contest this year, and she won 1st place. After winning 1st place in the club level speech contest, Ella won again at the zone contest, and advanced to the San Diego Optimist Club District Oratorical Contest. The Optimist Club Oratorical Contest wins are especially impressive because elementary, middle, and high school students all compete against one another. Despite being in 5th and 6th grade and competing against high school students, Ella and Nathan won 1st and 3rd place. 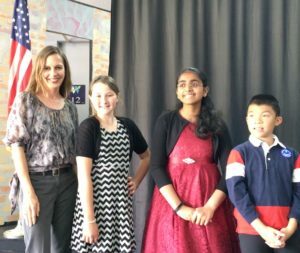 Another Academy for Public Speaking graduate who is a 6th grade student, Amrutha Challa, won 2nd place in the 2018 Del Mar Solana Beach Optimist Club Oratorical Contest. Last year Amrutha won 1st place at the club level, won again at the zone level, and competed in the district contest against high school students. Amrutha also won a special award and $50 this year at the San Diego County Fair Speech Contest. Interestingly, Amrutha won the Optimist Award! 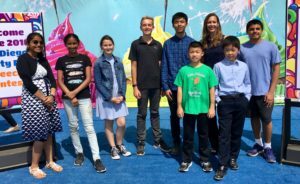 We are very proud of all of the Academy for Public Speaking graduates who competed in the Optimist Club Oratorical Contest and in the San Diego County Fair Speech Contest! This entry was posted in Academy for Public Speaking, Communication Skills, Confidence, Public Speaking, San Diego, Speech Contests and tagged academy for public speaking, Del Mar Solana Beach Optimist Club Oratorical Contest, optimist club oratorical contest, San Diego County Fair speech contest, san diego fair speech contest, Speech Contest. Bookmark the permalink.